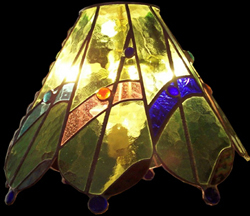 Owner and artisan Rebecca Hoffmann designs and creates stained glass especially for your surroundings. She is passionate about the craft and her talent inspires the beauty of glass. There is no substitute for the rewarding out come of a finished piece when it's exactly as you envisioned it. This window is one of Rebecca’s favorites! She custom designed and created it for the client’s master bathroom. After she installed it, the rest of the bathroom décor’ fell into place beautifully. The clients were so pleased. Window measures 38” in diameter. 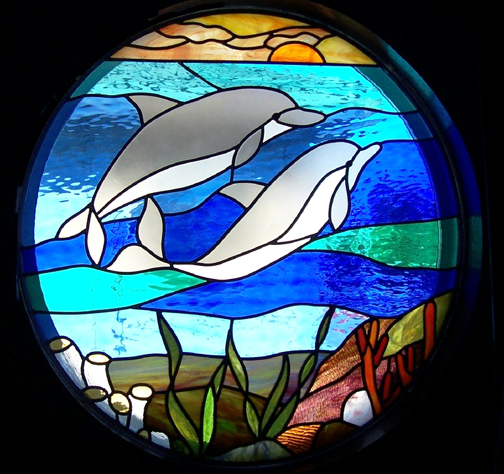 Owner and artisan Rebecca Hoffmann designs and creates stained glass especially for your surroundings. She is passionate about the craft and her talent inspires the beauty of the glass. There is no substitute for the rewarding outcome of a finished piece when it’s exactly as you envisioned it.